and only 7% on what we say.” Albert Mehrabian. Business Image Consultation – £300 – A one-to-one in-depth four-to-five-hour consultation where together we will discuss the business image you would like to project, your personal brand values, job role and career aspirations and review your natural colouring and body shape to develop a personal image that successfully communicates your brand. Includes Personal Brand Profile, 42-colour swatch wallet, and personalised Style Notes. 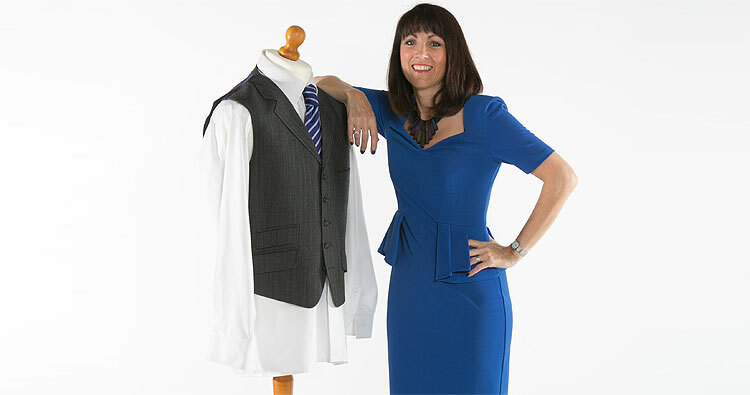 ‘Dress Like You Mean Business’ One-Day Top-to-Toe Consultation – £400 – A full day spent developing your business image, including a wardrobe edit and personal shopping experience. The day will be shaped around you and can include a full colour analysis to discover your very best clothing colours, top-to-toe styling advice (cuts/styles of clothes, fabrics, patterns, etc), a wardrobe edit to sort your wardrobe, create new outfit combinations and identify any potential ‘gaps’, as well as a shopping experience, making it effortless to maximise your impact and reputation. Includes Personal Brand Profile, 42-colour swatch wallet and a copy of 128-page Colour Me Beautiful book. Work-Ready Capsule Wardrobe – having a work wardrobe full of clothes that effortlessly mix and match makes getting ready for work each morning so much easier. I work with people on an ongoing basis to first develop an initial capsule wardrobe and then add selected pieces over the coming seasons to keep it current. We start by assessing your existing wardrobe and then build your capsule around it. Please contact me for full details. Me, Myself & I – Personal Branding Training Course – a powerful, high impact, results-driven programme designed to boost your business by developing your personal brand and image and enhancing your presentation skills. This 1 day workshop will run by Kevin Horlock and I and will be tailored to participants to maximise learning. Proposed date: May 2019 (date will be set to accommodate participant availability). Click here for a fuller description of the day and details on how to book.